McDonald's Switzerland is running a cheese-focused limited-time menu with a French name: Les Grandes Envies de Fromage, which translates to "large cheese cravings." There are three burgers on the menu. 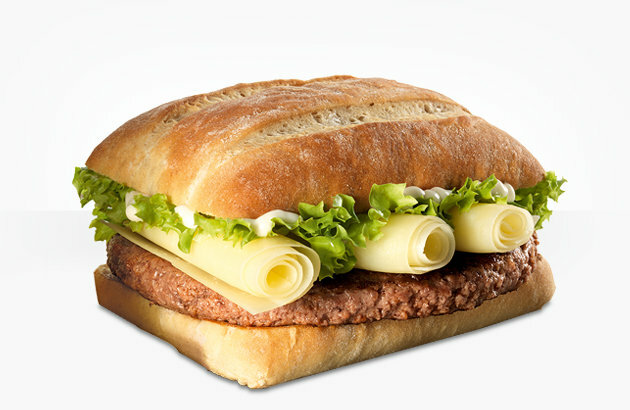 One of the burgers, the McSbrinz, features Sbrinz cheese, an AOP (a protected term of origin) Swiss cheese that sometimes comes curled up into rolled flutes. The three rolls of the distinctive looking cheese is joined by a Sbrinz sauce, lettuce, and a beef patty in a bakery roll. The burger was offered for a very limited time from January 15th through the 21st and again from February 5th through February 11th. The McGruyere features a slice of Swiss Gruyere AOP with lettuce, a beef patty, and a Gruyere sauce on a fancy-looking bun. The McGruyere was offered January 8th through January 14th and again on January 29th through February 4th. Finally, for goat-cheese lovers, there's the McChevre (chevre is French for "goat," so technically this is the McGoat). Similar to the other two burgers, it comes simply with a slice of goat cheese, a beef patty, lettuce, and a goat cheese sauce, on sourdough bread. The McChevre is currently being offered through February 18th (and was also offered from January 22th through the 28th). Each burger in the Les Grandes Envies de Fromage menu was/is 7.90 Swiss francs (~$8.85 US).